For the game, see: 1830. February 3 - Greece is liberated from the Ottoman forces as the final result of the Greek War of Independence. Negotiations for the borders of Greece continued until 1832, under the supervision of Russia, France and Britain, and Greece was internationally recognized as a sovereign state with the Treaty of Constantinople. January 11 - LaGrange College, now the University of North Alabama, opened its doors, becoming the first publicly chartered college in Alabama. April 6 - Joseph Smith and five others organize the Church of Christ, later renamed the Church of Jesus Christ of Latter-day Saints, the first formally-organized church of the Latter Day Saint movement, in northwestern New York. May 13 - Ecuador separates from Gran Colombia. June 26 - William IV succeeds George IV as King of the United Kingdom. July 5 - France invades Algeria - see French period in Algeria. July 17 - Barthélemy Thimonnier is granted a patent (#7454) for a sewing machine in France. It chains stitches at 200/minute. July 18 - Uruguay adopts its first constitution. July 20 - Greece grants citizenship to Jews. 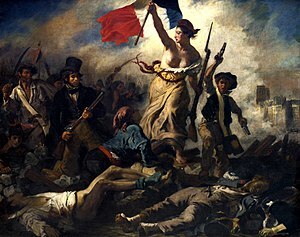 July 27 - France: Beginning of the July Revolution. August 9 - France: Louis Philippe becomes King of the French. August 13 - France: Duc de Broglie becomes Prime Minister. August 25 - Beginning of the Belgian revolution. August 31 - Edwin Beard Budding is granted a patent for the invention of lawnmower. September 15 - Liverpool and Manchester Railway opened (world's first intercity passenger railway operated solely by steam locomotives). October 4 - The Provisional Government in Brussels declares the creation of the independent state of Belgium, in revolt against the government of the Netherlands. November 29 - Beginning of a major Polish insurrection in Warsaw against Russian rule. December 5 - World premiere of Hector Berlioz's most famous work, Symphonie Fantastique, in Paris. December 20 - Recognition of the Independence of Belgium by the Great Powers. Alexandrite, a form of the mineral chrysoberyl, is discovered in Russia and named after Czar Alexander II. 180 people were married in 1830. There were 0 military battles in 1830. This page uses content from the English language Wikipedia. The original content was at 1830. The list of authors can be seen in the page history. As with this Familypedia wiki, the content of Wikipedia is available under the Creative Commons License.